Goblins are short, humanoid enemies. They live in tribes in their own small settlements—usually in or near caves and mines—and will attack any trespassers. 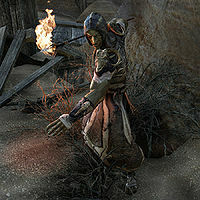 In general, they are hostile, and have been known to attack settlements. Cragkin Tribe - a tribe located in Qharroa Ruins. A Goblin's Affection: Save an inept apprentice's brother from an unplanned marriage. Bounty: Goblins: Kill goblins for the Cyrodiil Fighters Guild. Kinsman's Revenge: Help find Hrogar's missing sons. Protecting the Hall: Help defend Hrogar's Hold from a goblin attack. If the Spell Fits: Save a naked Nord from an evil witch's spell. Tarnish the Crown: Kill a goblin king. Goblin's Delight: Help with the murder of a cook's pet goblin. Goblin Marq: Find Marq and his special brew. Kings of the Grotto: Clear out an old grotto for a group of Mephala worshippers. Pledge: Fungal Grotto I: Explore Fungal Grotto I and return Undaunted. Rock Bone Diplomacy: Clear out a camp of goblins. The Toothmaul Ploy: Figure out what is going on in Toothmaul Gully. Waylaid Wine Merchant: Help a wine merchant recover his lost bottles of Balmora Blue Wine. Well-Armed Savages: Loot some Altmer weaponry from the Toothmaul goblins. Bonesnap Ruins Vanquisher 10 Defeat three of the champions in Bonesnap Ruins. Bonesnap Ruins Conqueror 50 Defeat all of the champions in Bonesnap Ruins. ​ Fungal Grotto I Vanquisher 10 Defeat the Goblin War Chief and the Dreugh King in Fungal Grotto I. This page was last modified on 7 September 2018, at 18:00.